Pretty much everything about Mardi Gras is guaranteed fun: the parades, the glitter, the beads, the food. 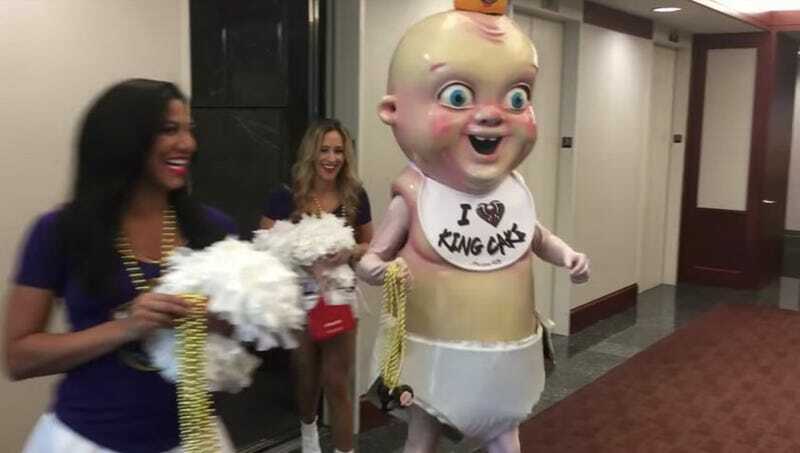 But not the New Orleans Pelicans’ King Cake Baby mascot, which currently haunts our dreams. This oversized King Cake Baby—which looks like Kate McKinnon impersonating Attorney General Jeff Sessions, now that we think about it—has spent the past few Mardi Gras seasons scaring the news media ... again, really not unlike Jeff Sessions. Has anyone seen King Cake Baby and Jeff Sessions in the same room? Sure, we’re willing to plant the seed of this conspiracy theory. The existence of this King Cake Baby Godzilla further means that there is someone among the Pelicans staff who found or constructed this get-up, and presumably is responsible for tucking it into a dark closet at night. That person scares us, too. We’re soothed only by the fact that with the end of Mardi Gras season comes—hopefully—an end to this baby’s reign of terror. Would that we could say the same for Mr. Sessions. Ask The Salty Waitress: How do servers feel about customers calling them by name?